This week, I am going with an interesting theme – Something Happened Week. The premise is… well… something happened. The world changed in some fundamental way, and the player characters in the setting are defined by that change in some way. Their experiences are driven by the altered world, and often they are trying to do something important that the changes to the world drive them to. 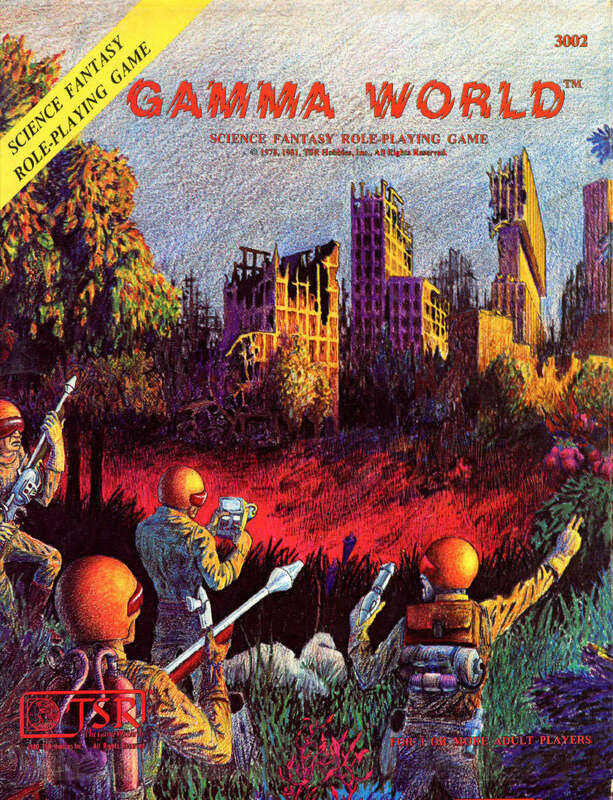 The first such experience for many of us who started playing RPGs in the beginning was the original Gamma World. Strange, random mutations, looking for vaults full of neat toys, and dealing with insane monsters that belonged in a Thundarr the Barbarian cartoon was the order of the day, and it changed the sense of what was possible in gaming for many of us. There have been many other editions of the game, all modernizing the experience in one way or another, but this is the classic that started it all off. Can you survive in a world gone mad? A world where civilization as we know it has been destroyed in a cataclysmic holocaust? What is left in this world? Find out and encounter such bizarre things as mutated plants and animals more terrible than you can imagine, radiation wastelands that stretch as far as the eye can see, and fearless machines gone uncontrollably berserk . . . This is the setting for a GAMMA WORLD™ campaign, with players taking on the persona of an individual character somewhere in this forbidding locale. In a quest for survival and in search of a better future, the players adventure across the land, enduring hardships and encountering dangerous obstacles and mysterious foes – never knowing quite what to expect. The result is a game which can go in many directions, but which will be challenging and fascinating no matter what the outcome. The GAMMA WORLD™ Set includes all the basics needed to set up your own “world”: game booklet (packed with terrible mutants, as well as guidelines for creating additional ones of your own), a large campaign map (designed to be easily modified by individual gamemasters), and a full set of polyhedra dice. The only other things necessary are a good imagination and a spirit of adventure! The GAMMA WORLD™ rules are also suitable for use with the ADVANCED DUNGEONS & DRAGONSTMrules. The GAMMA WORLD challenge awaits you – are you ready?